If you would prefer that the Exynos 9810 chipset powers your Samsung Galaxy S9 or Galaxy S9+, you can now purchase the international factory unlocked version of either phone from a seller on eBay. Besides relying on Sammy's own SoC to drive the new models, the units offer support for dual SIM cards. 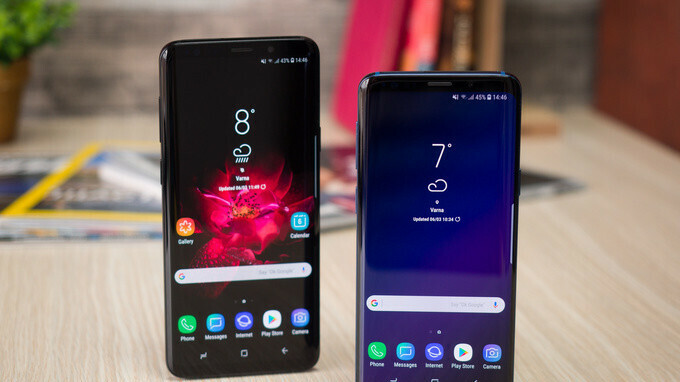 The Galaxy S9 is offered in black and purple and the Galaxy S9+ can be purchased in black only. All the other color options have been sold out. Both handsets support GSM carriers only, which means that Verizon and Sprint subscribers should just pass this by. The price of the Galaxy S9 (SM-G9600) is $709.99 with financing available that could allow you to pay as low as $34 a month over 24 months. The larger Galaxy S9+ will set you back $819.99 with installment plans starting as low as $39/month over 24 months. The seller has a 99.3% positive feedback score and as we write this, he has sold 188 Galaxy S9 units and 369 Galaxy S9+ models. Thus, limited versions of both phones are available. If you don't care whether your new Samsung flagship is equipped with the Exynos 9810 chipset or the Snapdragon 845 mobile platform, and support for dual SIM doesn't matter to you, there are better deals available with the four major U.S. carriers. Having said that, if you're still interested in the import units, click on the sourcelink below. They are listed as having the snapdragon chip though under the item description on Ebay. That’s the thing I had issue with, I messaged the seller asking if this is the China (Chinese) dual sim version, they couldn’t give me a straight reply, so I backed off. The Chinese one might actually be better. Should not have preinstalled apps like Facebook that you can not uninstall. True, not as good in some ways but maybe better in other ways. In Hong Kong and Taiwan they come with Exynos but have Facebook preinstalled with no uninstall option. That little Facebook spy is always running and tracking everything. The Chinese in China usually prefer a non-Chinese version because of spyware but if you live outside of China this is of no concern to you. If you live outside of China I would buy the Chinese model but if you live in China I would buy the overseas model. This is if you care about privacy. This is if you care about the back door thing.. Pretty sure you loose warranty for sure if you import phones from other country, as they mostly never have the original purchase receipt handed to you. I would never import a Samsung phone again. If something happens to your phone then you will have to ship it to the country of origin. Plus you won't be able to use Samsung Pay, degrading the experience of owning a Galaxy phone. Just buy an unlocked version at the one of the cariers. For myself, if buying outright, I'd just go through Samsung.com. It won't be locked, and no carrier software. But it comes with other bloatware in America. Some of it with no uninstall option too. That's interesting to know. Exactly what non-removable bloatware would that be, by the way? Yea, S9/s9 plus article, 2 weeks after the announcement, and yet the pictures from the wrong 1 month old leak, pathetic iPhoneArena, pathetic. I've bought many phones on ebay new, and within the UK for a great price. Thoroughly recommend it, ebay is their to protect the buyer so any issues you will be covered 100%. Especially paying with PayPal.